The effectiveness of classic approaches to aligning execution with strategic plans are increasingly questioned by executives & managers. Operational processes are not keeping up with the pace of change and strategic plans are becoming obsolete before they are printed. Is eliminating long-range planning the answer? Not when investors and board members are expecting more transparency on long-term plans and performance expectations! 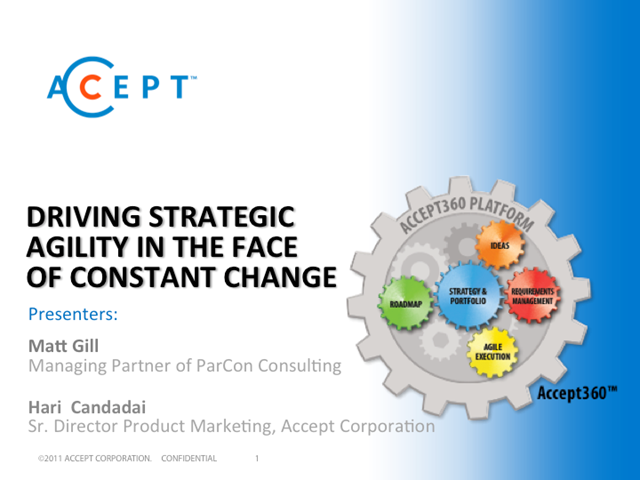 The big question keeping you up at night - “How can my execution efforts remain aligned with my corporate strategy in the face of constant change”? Few executives have found a realistic path to put innovation management theory into practice. Many realize that things need to change, but are concerned that required changes will inflict significant disruption within their companies, and are dubious that the effort will yield promised growth. To achieve true Strategic Agility, you need to improve the way you manage execution efforts while staying aligned with the corporate strategy and still meeting customer needs. You must also anticipate changes in market dynamics and re-prioritize the innovation initiatives and product portfolios accordingly.